“There’s no place like home” — this was the line that we usually hear from those people who experienced leaving their families for some reasons. I, myself, experienced how it is to be away from home. During my college years, I need to leave and to be on my own because our house was far from the school where I was enrolled. At first, it was difficult on my part since this was my first time to be separated from my family. Later on, I learned to adjust with the new environment and I met new friends. Along with this, temptations come in. I feel free and I can do whatever I want because I’m away from home. I enjoyed being free with my friends but my joys turned upside down. My grades were almost failing and I am afraid to inform my parents. But with the trust and support of my parents I coped up. With this event in my life, one thing I realized is that I want to be with them because “There’s no place like home.” I met new friends but the feeling was different when I’m home. Even though I experienced to be scolded and punished, I still want to be home because I know where I belong and they are only doing such things to help me grow into a responsible person. In return, I do my responsibilities with zeal and joy. I can relate my experience to the Gospel of St. John about the Vine and the Branches, wherein the relationship between God the Father and God the Son was manifested. Jesus likened Himself into a Vine and the Father as the vine grower who takes away the branches of the vine that are not useful. The vine grower did this in order to make the vine bears more fruit. Parents are like the Father (vine grower) who disciplined us if we do something wrong or we are not on the right path . But it does not mean that they don’t love us, as a matter of fact they love us very dearly. They only wanted the best for us. In our lives, we also experienced to be pruned, through the obstacles that we encountered maybe in a form of physical pain, emotional pain, spiritual dryness and others. These are only God’s ways of reminding us that there is God whom we can rely on, because sometimes we are overwhelmed with the joy and freedom that we experienced and we tend to forget the true source of this, who is God. Let God be the center of our life, like the Gospel says: “Remain in me, as I remain in you. Just as a branch cannot bear fruit on its own unless it remains on the vine, so neither can you unless you remain in me.” God is the source of our life, so in all that we do let God be our inspiration and guide because we are nothing without God and through God we can enter our heavenly home. iLUMEN is the official preaching blog of the Dominican Family in the Philippines composed of priests and brothers, sisters and nuns, laity, clerical fraternities, youth and affiliates. True to our Dominican motto of "Contemplari et Contemplata aliis tradere" (To contemplate and to share the fruits of one's contemplation), we are offering our reflections on our life and ministry. "Lumen" is latin for 'light.' 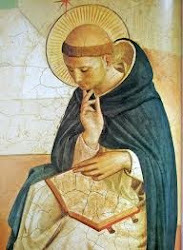 With the inspiration of our holy father St. Dominic, Lumen Ecclesiae, may we become instruments of light through this blog. 30th Sunday in OT (C) - Saint, Sinner — or Both?